For me, it was balance sheet and profit and loss statement! Well, it’s just not me. Year 2016-17 is the first phase of mandatory compliance with new Indian Accounting Standards (Ind AS) for certain companies. In a way, they are also gearing hard to present their Ind AS compliant financial results. On the top of it, lies the tax calculation which has become all the more tedious in the light of Ind AS compliance. Under the income tax law, companies are required to compute tax liability as per normal provisions of the law as well as Section 115JB pertaining to minimum Alternate tax (MAT). The purpose is to bring into the tax net those companies which earn substantial book profits and pay dividends but do not pay any tax due to various tax concessions and incentives provided under the Income-tax Law. For computing tax liability under normal provisions, taxable income is arrived at after making adjustments for tax accounting standards in accordance with Section 145. 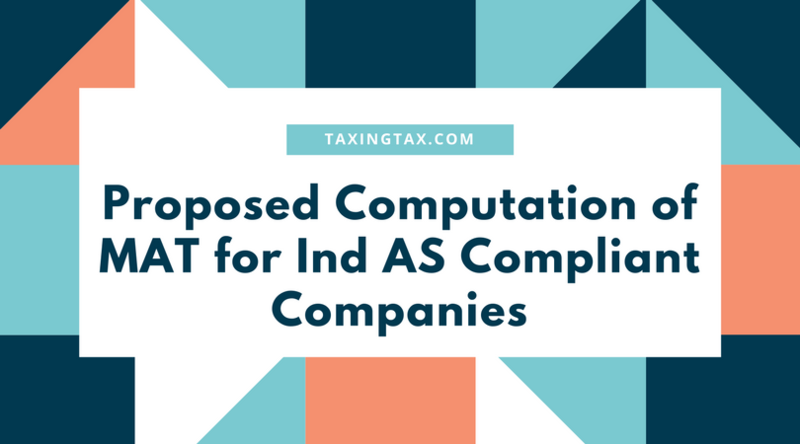 In this context, it is relevant to mention that on 31 March 2015, the Central Board of Direct Taxes (“CBDT”) notified 10 tax accounting standards, now known as Income Computation and Disclosure Standards (ICDS). 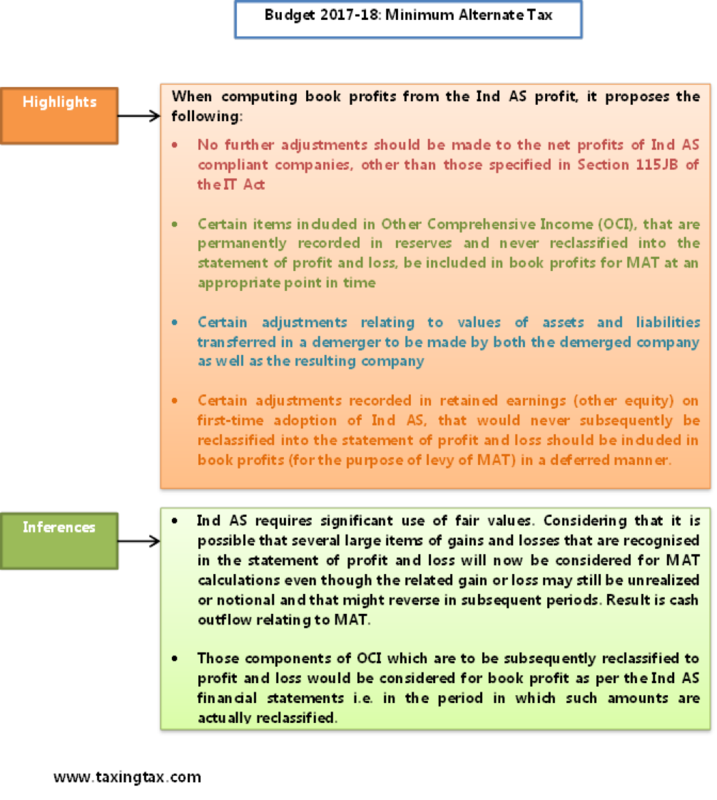 For computing MAT, book profits as computed under Section115JB are the base. The computation method is relevant for companies preparing financial statements under erstwhile AS. To bring clarity on the tax implications of transition to Ind AS, Budget 2017 proposed certain amendments to Section 115JB. Adjustments relating to first-time adoption of Ind AS. 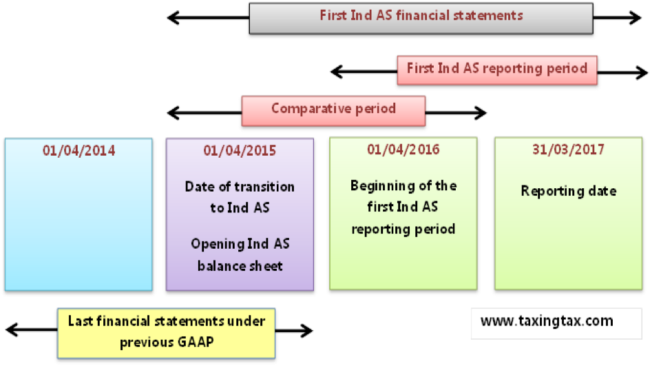 In the first year of adoption of Ind AS, the companies would prepare Ind AS financial statement for reporting year with a comparative financial statement for immediately preceding year. As per Ind AS 101, First time adoption of Indian Accounting Standards, a company would make all Ind AS adjustments on the opening date of the comparative financial year. The entity is also required to present equity reconciliation between previous Indian GAAP and Ind AS amounts, both on the opening date of preceding year as well as on the closing date of the preceding year. Refer the diagram before. To provide a reference year for first time adoption adjustments, the bill proposes to consider the amounts adjusted as of the opening date of the first year of adoption. For example, companies, which adopt Ind AS with effect from 1 April 2016, shall consider the amounts adjusted as of 31 March 2016 for computation of MAT liability for previous year 2016-17 (AY2017-18) and thereafter. Further, in this case, the period of five years proposed above shall be previous years 2016-17, 2017-18, 2018-19, 2019-20 and 2020-21. Preparation of opening Ind AS balance sheet will typically entail recording a series of adjustments relating to the transition from Accounting Standards to Ind AS. Generally, these adjustments would be recorded either in OCI or in retained earnings (other equity) in the opening balance sheet. Several of these items would subsequently never be reclassified to the statement of profit and loss. At this point, it is worth noting that at present it is down to individual accounting standards to direct when gains and losses are to be reclassified from equity to P/L as a reclassification adjustment. 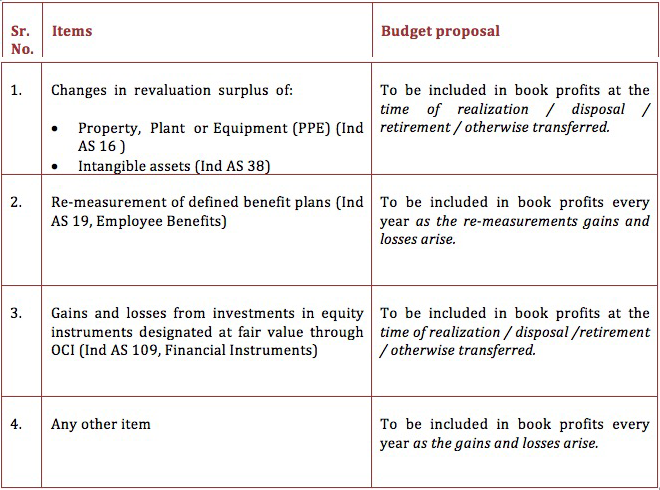 Ind AS 101 permits an entity to measure items of PPE and intangible assets at the date of transition at their recomputed values, measured in accordance with Ind AS 16 and Ind AS 38 respectively from inception. Ind AS 16 and Ind AS 38 permit cost or revaluation model. A first-time adopter of Ind AS, which opts for cost model, can opt to apply the ‘deemed cost’ exemption and measure items of PPE and intangible assets either at their fair value or at carrying value as per the previous GAAP, on the date of transition. As per Ind AS 109, an entity may make an irrevocable election to present fair value changes in OCI for its investments in equity instruments on initial recognition. Therefore, the changes in the fair value of such an investment in an equity instrument would be recognised in OCI. On first-time adoption of Ind AS, an adjustment would be made to retained earnings (other equity component) when such investment is recognised at fair value in the balance sheet on the date of transition to Ind AS. previous GAAP carrying amount at that date. 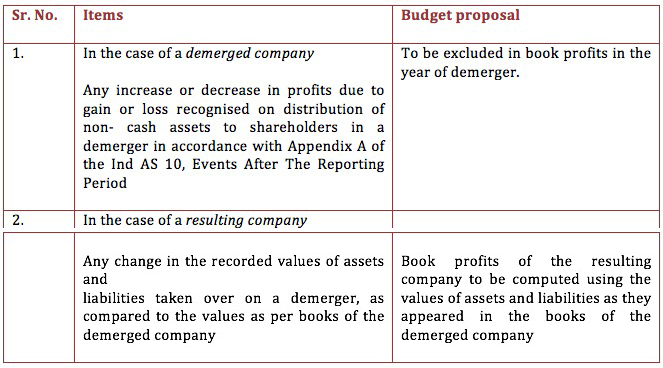 Under Ind AS, when there is a demerger, resulting in a non-cash distribution to shareholders, the difference between the fair value and the carrying value of the assets transferred is required to be recognised as a gain or loss in the statement of profit and loss of the demerged company and correspondingly, the distribution to shareholders is reflected in reserves at the fair value of the assets transferred. However, in the case of a resulting company, the property and the liabilities of the undertaking or undertakings being received by it are recorded at values different from values appearing in the books of account of the demerged company immediately before the demerger. Section 115JAA contains provisions regarding carrying forward and set off of tax credit in respect of Minimum Alternate Tax (MAT) paid by companies under section 115JB. Currently, the tax credit can be carried forward upto tenth assessment years. The Bill proposes to amend section 115JAA to provide that the tax credit determined under this section can be carried forward up to fifteenth assessment years immediately succeeding the assessment years in which such tax credit becomes allowable. It is also proposed to amend section 115JAA so as to provide that the amount of tax credit in respect of MAT shall not be allowed to be carried forward to subsequent year to the extent such credit relates to the difference between the amount of foreign tax credit (FTC) allowed against MAT and FTC allowable against the tax computed under regular provisions of Act other than the provisions relating to MAT. The companies covered under both Ind AS and Accounting Standards should assess the recoverability of MAT credit over the extended period. On the whole, the proposed amendments have considered a fairly practical approach to dealing with MAT computations for Ind AS companies. Only the concept of horizontal equity is missing between Ind AS reporting companies and others. It is suggested that all companies now need to reassess all their Ind AS accounting policy choices and transition date adjustments in light of the clarity on the tax implications and make the necessary changes before closing their annual accounts in March this year. Keep visiting www.taxingtax.com for further updates on Budget 2017-18.